Several years ago in 2014, I created a black and white paper doll called Her Ladyship. It was a fun project and I still really like a lot of the designs I made for that paper doll. If you like to color, than I would highly recommend printing her out. She’s a hoot to color. An ice-skating toilette from that paper doll inspired today’s Poppet ice skating toilette. Sometimes, when I am short on ideas, I go back to my own older work and look for things to adapt to the new series or dolls. I never do this one request (so please don’t ask me), but I do it when I feel moved to do it. 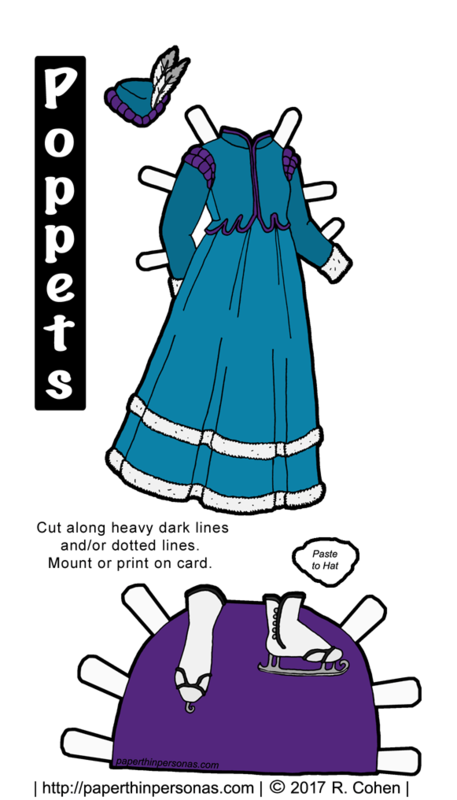 Personally, I think of this as a princess outfit (though here is no crown) and it could go with some of the other fantasy things I have created for the Poppets, especially this one and this one. There’s a much more pink version of today’s ice skating outfit over on the Patreon page for my Patrons. It’s very pink. In case you’re wondering, next week will be Ms. Mannequin paper dolls and the B&B series. As I mentioned on Monday, I am basically posting backlog for the month of December while I work on new things to post beginning in January. By the way, I’ve clearly been playing around with putting up my new blog theme. Please be patient with me while I work out all the kinks. Love the new format, too. It’s so clean & simple. Really nice choice. Thank you. It is the first time I have paid for a theme and I think it was totally worth it. Yes, I am learning to draw skates. There has been a learning curve involved.